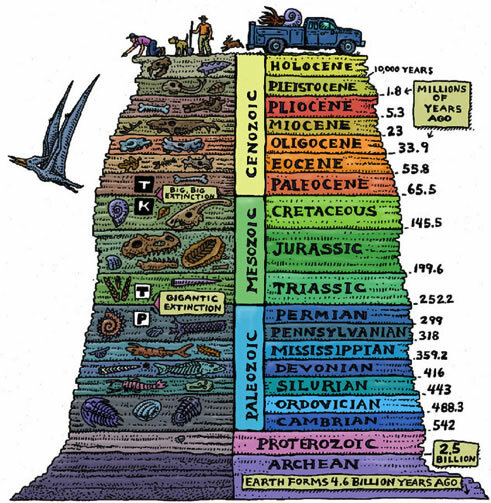 Great 3 min video on the Fossil record and why its layered with critters like it is. Short answer, this “layering” is exactly how we would expect to see all the animals of the earth to be covered if a Global flood occurred. Considering that 95% of all fossils are marine fossils, this again makes an amazing case for how the animals died in succession; starting when the fountains of the deep broke open (Gen 7) and started to flood to the continents. This is why as well we find marine fossils all over the earth. This the fossil record is not evidence for evoltuion, but what happens to a planet of animals and vegetation that get suddenly covered in water! Check this!